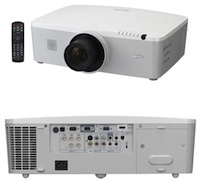 Sanyo announced Tuesday that it will ship four new wide-format 3LCD projectors designed for use in large conference rooms and lecture halls. The projectors--the PLC-WM 5500, PLC-WM 5500L, PLC-WM 4500, and PLC-WM 4500L--feature a 1,280 x 800 (WXGA) resolution, 16:10 aspect ratio, a projected image size that ranges from of 40 inches to 400 inches, and a contrast ratio of 800:1. The PLC-WM 5500 and the PLC-WM 5500L both have a brightness of 5,500 lumens and use a 330 watt lamp, while PLC-WM 4500 and the PLC-WM 4500L offer a brightness of 4,500 lumens and ship with a 275 watt lamp. Both the PLC-WM 5500 and the PLC-WM 4500 come equipped with a powered zoom lens. Lenses are optional for projectors in the PLC line with the L designation. All four models feature PIP and split-screen video modes. Other features include RJ-45 network connectivity and support for HDMI video. Inputs are common to all four projectors and include component (three-port BNC), component (RCA), RGB (mini D-sub 15-pin), DVI-D, HDMI 1.3, and S-video. The PLC-WM4500 and the PLC-WM5500L are scheduled to ship in June and August with price tags of $4,995 and $4,545, respectively. The PLC-WM5500 and PLC-WM4500L will be available in July and will retail for $5,645 and $4,095.